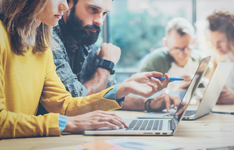 The Advanced Business Process Modeling and Requirements Gathering course, offered by Florida Atlantic University, provides students with advanced tools and techniques of business analysis, as well as a framework to build their business process modeling skills and abilities. Students will gain an understanding of how to strategically plan and align their projects, project modeling, diagramming, and requirements gathering methods to enhance the production and efficiency of their projects. Students will receive 14 Hours-PDUs/ 1.4 CEUs upon completion of this classroom course. The cost of this course is $1,595. Fill out your details to find out more about Advanced Business Process Modeling and Requirements Gathering. The two-day program gave me additional structural tools to create robust functional documents for each project that each member of the project team can circle back to. The program has also cleared my mind on how to document each functional task, steps, benefits, scope vs. out-of scope, that need to fit the overall organization strategy.